And… oh, actually, this is such a no-brainer, I could almost just finish the story with that. (And that’s actually kind of cool.) But let’s offer a little more detail. How does it work? Plus in a compatible drum machine via USB, and your drum machine follows Serato’s BPM. How is that different from existing solutions? Well, it saves you the added step of configuring MIDI clock, at the very least. We’ll be able to test this shortly to check it in action, but it also presumably irons out other performance issues that can crop up with MIDI. Oh, plus, if you didn’t understand any word I just said – this update is totally for you. You plug it in and it works. And rankly, that’s how it ought to be. How do you get the update? Looks like all Serato DJ Pro owners with Roland hardware will be squared away. This is officially called the “Serato x Roland TR-SYNC update” but it appears you basically get plug and play support in the latest version of Serato DJ Pro. Why would you want to do this? Well, even short of doing a full-on hybrid set, it can be fun to layer sum drum parts or (on the TR-8S) samples and so on. You could also then go on to sync still more gear from the TR. Oh, and the Boutique TR-08 and TR-09 are advantageously tiny. Even the most cramped DJ booth could easily fit one. Bottom line – it’s nice to see some challenge to Pioneer’s own link protocol with their CDJ. Why shouldn’t you plug in drum machines and have them groove along? That’s why they’re drum machines. 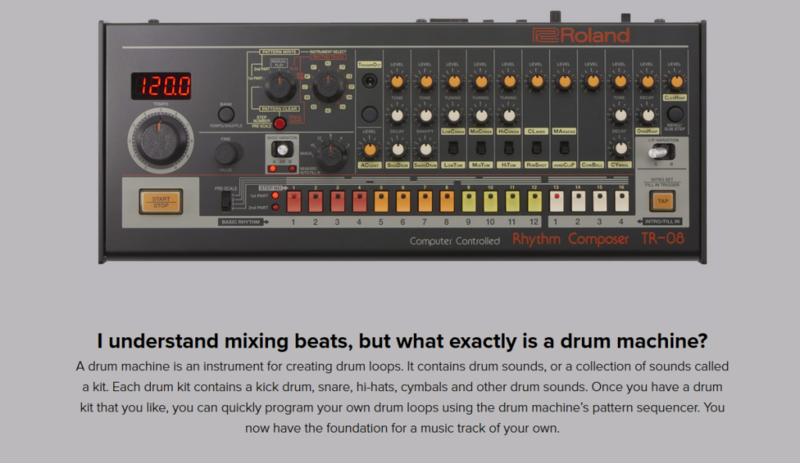 What is a drum machine? It is … a machine … with drums in it. The legendary TR-808 and 909 are the most influential drum machines of all time and have become part of the DNA of everything. They’ve literally just reprogrammed our genetic code and destroyed our minds and now all music genres and all carbon-based life on Earth have been assimilated, leading up presumably to some kind of invasion – once everyone has become a DJ. Isn’t making your own beats complicated? No, it’s not, but that won’t stop you from becoming newly obsessed with how the beat is never right and the longer you listen to it, the more your grasp of all reality will melt away leaving you only with this loop. See DNA issue, above. How do I include my own beats in my DJ set? This is a question that has truly no accurate answer, but if you call yourself a DJ, you’re already part of a global phenomenon started by a surprisingly small handful of people of color (very poorly attributed, as per usual) who just decided to show off and also not to have gaps between tracks and then got really deep into using phonographs incorrectly, so… uh, experiment, if you like, until you find something you like? I’ve done it again. Long article. Also, not only is this not sponsored product, I now probably have to buy some apology rounds of drinks for whoever did write the original ad copy. Sorry. There, instead of configuring MIDI, you now have more time to read my blathering.